The chief of the UN’s nuclear watchdog arrives in India on Monday on a long scheduled trip that has turned into a potential political flashpoint as a nuclear deal with the US threatens to spark snap elections in the country. Mohamed ElBaradei, director general of the International Atomic Energy Agency (IAEA), is ostensibly on a technical visit to speak at an energy conference, visit a nuclear research facility in Mumbai and meet Indian nuclear officials. But the trip comes just as India faces an informal end-October deadline to begin securing clearances from the IAEA and others to clinch the nuclear deal—opposed by its Communist allies who say it would enslave New Delhi to US policy. The deal would be a milestone in Indo-US relations, not the best of friends during the Cold War. It would allow India to import US nuclear fuel and reactors, despite having tested nuclear weapons and not signed the Non-Proliferation Treaty. But the Left has warned the government against negotiating with the IAEA to place India’s civilian nuclear reactors under UN safeguards, one of the first steps towards making the deal operational. Sonia Gandhi,chairperson of of the ruling UPA government, sharpened the rhetoric on Sunday in a statement widely seen as hinting she was ready for a snap vote, calling opponents of the nuclear deal enemies of development. 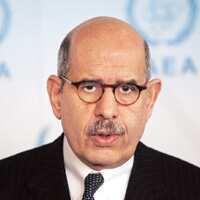 The IAEA said ElBaradei is not on a political visit. “There is no expectation that the India-US agreement will be the front and centre of his visit there," said a Vienna diplomat close to the IAEA. “It just depends on India, when the timing is right, to make the essential approach about drafting a safeguards agreement. We don’t have any indication that this is going to happen then." But some experts say timing is everything when it comes to ElBaradei’s visit and that government officials could meet him, a move bound to anger the Left. “There is little doubt the Indian government has decided to go ahead with the deal and couldn’t care less what the Left has to say," R.R. Subramanian, an independent nuclear expert, said. “So I think they are going to talk to ElBaradei." India’s department of atomic energy said ElBaradei would be arriving on Monday night and that his official visit would start on Tuesday. The Vienna-based diplomat said ElBaradei could discuss the deal informally. “I know the US considers ElBaradei’s trip extremely important at this time," the diplomat said. “But for the IAEA, it’s a technical matter—we get a list of facilities first and then we start moving. In general there might be a discussion of where things stand. But the issue is still in a political realm and it is not for the IAEA to touch that." Mark Heinrich in Vienna contributed to this story.